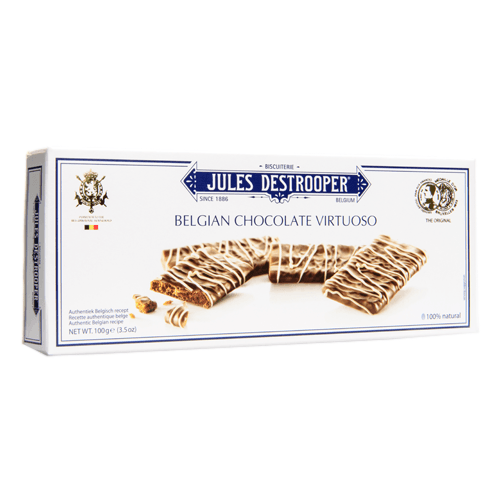 Jules Destrooper Belgian Chocolate Cinnamon Cookies are crispy artisan cinnamon cookies, topped with Belgian milk chocolate and sprinkled with a tasty white chocolate. This Belgian house was born in the middle of the 19th century by the hand of Jules Destrooper, a baker who began to give his customers some almond-shaped biscuits. Due to the success of their cookies, began to produce these sweets to scale. To this day, Jules Destrooper cookies maintain the same original recipe that led to success based on the use of natural ingredients without additives, preservatives or coloring.